The University of Maine wasted little time filling its head football coaching vacancy, hiring from within Friday and promoting offensive coordinator Nick Charlton to the post vacated a day earlier by Joe Harasymiak. 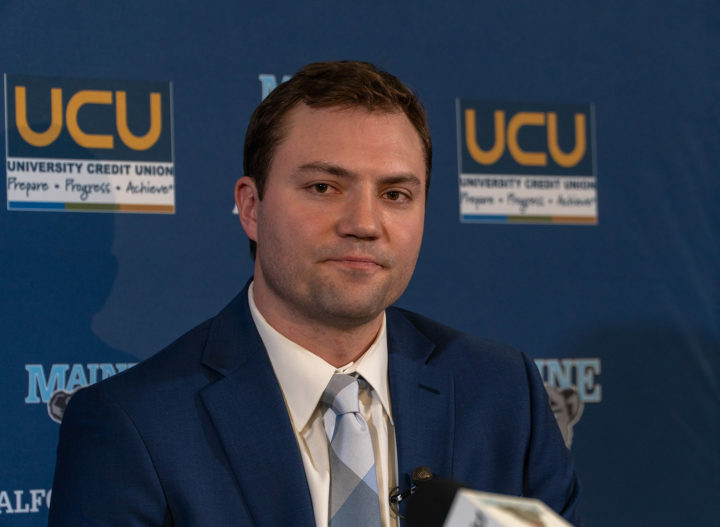 Charlton, who turned 30 Thursday, was interviewed for the job that evening and was introduced as the 36th head coach in program history during a Friday afternoon press conference in the Alfond Family Lounge on the Orono campus. He becomes the youngest Division I football coach in the country, a distinction held by his predecessor only three years ago. Nick Charlton fields questions from the media on Friday as he is announced as the head football coach at the University of Maine during a press conference at the Alfond Family Lounge. At 30, he becomes the youngest Division I head coach in the country. Western Illinois coach Jared Elliott is 31. Charlton and the university have agreed to contract terms, but the contract has not yet been finalized, said Tyson McHatten, senior associate director of athletics for external operations. He said that process should be completed soon after Christmas. Harasymiak was in the third year of a four-year contract that paid him $153,000 per year. It was the lowest salary in the 11-team Colonial Athletic Association. Harasymiak, who led UMaine to a 10-4 record, the CAA championship and a berth in the Football Championship Subdivision national semifinals, resigned as the Black Bears coach Thursday morning to become the defensive backs coach at the University of Minnesota. Charlton looks forward to welcoming back 18 starters for next season’s pursuit of another conference title and a deep postseason run. “Expectations were going to be very high,” he said. “Whether I was still the offensive coordinator or head coach, those expectations were going to be there so as a team we’ve got to be able to match that. There can’t be any complacency. Charlton said his immediate priorities in his new post are threefold. One is filling out his coaching staff, as the Black Bears have openings at offensive coordinator and defensive coordinator with the move of defensive coordinator Corey Hetherman to James Madison University. “Recruiting is the lifeblood of the program,” Charlton said. Charlton, who is in his fourth year on the UMaine staff overall and his first as the offensive coordinator, directed an offense this fall that helped the Black Bears win the 2018 Colonial Athletic Association championship and secure its first two FCS playoff victories with its best-scoring offense (26.5 points per game) since 2013. That offense featured sophomore quarterback Chris Ferguson, who passed for 2,372 yards and 22 touchdowns while earning a spot on the College Football Performance Awards FCS National Performer of the Year Watch List, and running back Ramon Jefferson, the first freshman in school history to rush for 1,000 yards in a season. Charlton joined the UMaine staff in spring 2015 as an assistant coach with the wide receivers. He was named UMaine’s special teams coordinator in April 2016, a role he held until being named offensive coordinator in February. Charlton helped produce 12 all-conference players during his time at UMaine. Ralph said he spent more time observing Charlton and other members of the coaching staff as the season progressed to prepare for Harasymiak’s potential departure and added it was important to fill the vacancy quickly. There are several reasons Charlton is the right man for the job, Ralph said. “He has a wonderful way of being able to connect with our students and is really interested in them not just as football players but as people,” Ralph said. “I think there’s a really high degree of trust from our students because of that and, boy, it’s rare in this day and age to find coaches who can connect with that age group. Ralph said no decision had been made regarding a replacement for Harasymiak when Hetherman left to become defensive coordinator at James Madison University, one of UMaine’s CAA football rivals. That move was announced Thursday. Charlton graduated from Boston College in 2011 with a bachelor’s degree in philosophy. He received a master’s degree from Boston College’s Woods School of Advancing Studies in 2013. He began his coaching career at his alma mater, first as an assistant to the special teams coordinator in 2012, then as a graduate assistant from 2013 to early 2015. Charlton and his wife, Maria, have a 1-year-old daughter, Madeline.